Fans that rely on fixed-speed motors in combination with dampers can squander energy if the regulation or restriction of airflow regularly exceeds 20% of design flow. In such cases, frequency converter may offer a more-energy-efficient option. The critical question is when to employ mechanical methods of airflow regulation and when to employ frequency converters. A mechanical method generally incurs lower upfront capital costs but, depending upon the application, a frequency converter may turn out more cost-effective when considering long-term energy use. So, let's examine how to determine which option is the most efficient for the application. Frequency converters reduce airflow without dampers or other mechanical controls. They allow the operator to adjust the frequency of electric power to the motor and thereby slow down or speed up the fan. frequency converters decrease flow noise and stress on equipment at reduced speeds. They often are the ideal solution, provided you can justify the initial capital expenditure. Frequency converters may be incorporated into the original fan design or may be retrofitted to an existing fan. However, retrofits may demand important adjustments to the fan or to the coupling between the motor and fan. The question of airflow regulation comes into play when an application requires that static pressure and air volume outputs drop below their design operating points. Historically dampers were the solution in such situations. Dampers are used with a fixed-speed motor frequency converter. Several types of inlet and outlet dampers exist, as I'll describe. Some of these options remain viable for applications that require minimal airflow restriction. Before using dampers, however, plant managers need to carefully consider issues relating to energy consumption; stress to fans and fan equipment over time; and how frequently, to what extent, and to what degree of precision airflow must be restricted. Inlet damper control is widely used to increase operating efficiencies in air movement systems. Most inlet dampers pre-spin incoming air in the same angular direction as the centrifugal fan wheel rotation. This directed air movement reduces power consumption by the fan pressure and airflow, thereby cutting the energy required to operate the fan. Multiple vanes upstream of the fan wheel inlet provide it with a controlled presentation of air that enables smooth control over a wide range of operation. Inlet dampers create a new fan performance curve for every damper position, losing efficiency as airflow rates decrease (Figure 1). The two main types of inlet dampers are louvered and radial. Louvered inlet dampers typically have parallel blades and work well in dirty airstreams. They also are available with opposed blades — but this configuration isn't recommended because it doesn't pre-spin the air. Radial inlet dampers, due to their ability to pre-spin air more effectively, typically are more efficient than louvered ones. Other types of inlet dampers include: vortex dampers, which require inlet boxes and are available in cantilevered blade and center hub designs; and variable inlet vanes, which require cone-shaped inlet pieces and are used only with clean air streams. Both boast efficiencies comparable to those of radial inlet dampers. If an air movement system is infrequently used, inlet dampers may come out on top in an initial-cost/potential-energy-savings comparison of airflow regulation devices. They are especially effective when restricting airflow by less than 20%. Some caution is in order when dampers severely limit airflow. Restricting airflow by as much as 70% may lead to flow instability or rotating stall, i.e., air starvation resulting in high-amplitude pressure pulses. Take the recent case of a steel mill operating coke-oven-battery scrubber fans with inlet dampers 90% closed. Fan professionals documented severe vibration and cracking of fan casings. Measurements of vibration, pressure pulsation and frequency confirmed a rotating stall condition. After installing a frequency converter, the mill could leave the damper fully open and regulate airflow by adjusting the fan speed. The fan then smoothly operated at all process flow rates. The mill realized energy savings estimated at more than $250,000 annually. These control flow by restricting the airstream's path at the outlet. They are rarely used on large industrial fans due to their poor efficiencies (Figure 1) and potential to damage system components. Partially closing, or throttling, parallel or opposed damper blades provides the desired reduction of flow. However, pressure increases on the upstream side of the dampers boost backpressure on the system. This resistance causes the fan's operating point to shift negatively on its performance curve. Excessive damper use may damage system components. Highly throttled outlet dampers can create severe buffeting and very high backpressure that may cause system components to prematurely wear, overheat or even crack, leading to increased operating and maintenance costs. Such dampers also are prone to corrosion in dirty airstreams. In addition, particulate matter buildup on damper blades and thermal distortion of damper elements can impede the ability to adjust the blades for throttling. Frequency converters generally offer the smoothest flow control over the widest range of volume and pressure. With proven energy-saving capabilities, they're a popular choice for air movement systems that operate for long periods at reduced flow and pressure. In addition, frequency converters are compact and easily added to most existing motors, and they reduce common fouling problems associated with outlet and inlet dampers, such as excessive vibration, noise and equipment wear and tear. In other words, halving a motor's speed will reduce power consumption to one-eighth. For example, a drop from 1,000 rpm at 1,000 BHP to 500 rpm results in a power reduction to 125 BHP. Much less energy is needed to run the motor at the lower speed. The soft-start capabilities available with frequency converters offer further opportunities for decreasing energy demands. Motors typically experience higher currents during startup than during normal operation. frequency converters allow the motor to be started with a lower current. By eliminating the higher startup power surge, frequency converters reduce wear on motor windings and the controller, and lower the severity of voltage sags that may affect sensitive equipment. Frequency converters also reduce airflow noise at lower speeds and air volumes. Throttling airflow with dampers causes increased noise levels that may diminish worker comfort. Despite the typical benefits of reduced electricity demand and maintenance costs, frequency converters aren't suitable for all applications. Further, fitting a frequency converter depends upon several critical fan design considerations: 1) natural resonant frequencies over the full operating speed range; 2) couplings; 3) bearings; and 4) system static pressure. The various components of air movement systems have natural resonant frequencies. If excited during operation, these frequencies may cause vibratory stress and fatigue, resulting in noise and possibly cracking or destroying certain components such as impellers, shafts, bearings and foundations. Resonant impact testing can determine natural resonant frequencies. A key one is the torsional resonant frequency, which is calculated using data collected from components in the air movement system, including the fan, coupling and motor assemblies. Fans typically are designed to have normal operating speeds above or below any natural resonant frequencies, including torsional frequencies. If the normal operating speed exceeds these frequencies, frequency converters run the risk of hitting them as the rotating speed is decreased. The first fan speed at which a shaft lateral resonant frequency is reached is called the first critical speed. Various system alterations can shift resonant frequencies outside of the fan's operating speed range and thereby avoid hitting the first critical speed. The most common choice for altering torsional resonant frequencies is to change couplings — e.g., to elastomeric block-type couplings or other couplings with high damping characteristics. Modification to the fan rotor also can alter resonant frequencies in the system, enabling the preferred operating speed range. In addition to mechanical alterations, it's possible to program the frequency converter to lock out speeds that are near the first critical speed or other speeds that may excite natural frequencies. A frequency converter professional should be involved in this process. Bearings also require careful selection to match the air movement system. Sufficient operating speeds are necessary for the proper operation of some bearing types, including sleeve bearings; antifriction bearings typically perform well at any speed. In systems utilizing duct outlets fitted with outlet dampers that open during operation, sufficient static pressure is required for the dampers to properly function. If pressure levels are too low when the fan's rotational speed decreases, the dampers won't open. So, examining the minimum operating speed needed to fulfill pressure requirements is essential to determine if a frequency converter is the best fit for these situations. Only one point exists at which the power efficiencies for inlet dampers, outlet dampers and frequency converters are essentially the same — maximum speed. With maximum flow, power consumption is relatively similar for all three options. As flow demand decreases, frequency converters typically offer the best efficiency. 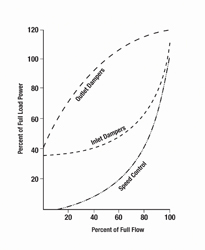 However, inlet dampers may be a viable alternative if system flow demands remain consistently in the 80%–100% range. For most systems, outlet dampers aren't a viable means of flow control. Remember, though, choosing the best flow regulation device for an operation demands careful analysis.